I finished reading this book last night since it was too late to publish my review I decided to leave it for today. It was a gift that I was so excited to receive because as you may know I am Buchi Emecheta's fan. Actually, one of my purpose in reading is to read all of her books. 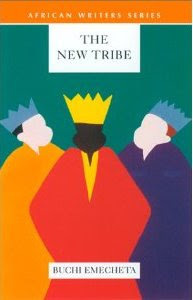 The drawings of this book cover reminds me of the three wise men that visited Jesus Christ after his birth although this author does not write about religion I decided to give it a try anyway. In the first few pages I was so disappointed that I convinced myself that someone else wrote this book and decided to publish it with Buchi Emecheta's name since she is such an acclaimed writer. The story started with a British family called the Arlingtons, that due to some circumstances were forced to adopt a son called Chester allegedly to be of a Nigerian nationality, this boy turned out to be the main character of the novel. I thought Emecheta always writes about the Nigerian people mainly from the village of Ibuza, her main characters always Nigerian women who struggle against all odds to have a voice of their own in their society. Is she now writing about an adopted child by a British family? not that it is not an interesting topic to write about. Chester grew up so confused and so willing to find out who his real parents were and why they gave him for adoption. His investigations led him to Nigeria from there on the story started becoming very interesting that I was glad I continued. There was so much drama that I thought it was impossible to end the book in the few pages remaining, but it ended in a very funny way that made me think that Emecheta was really the author of this book even though she was not writing about the Nigerian women from the village of Ibuza. She sent out that message of hers; Who are really your people? Those who gave birth to you or those who brought you up with so much love, accepted you as who you are and most of all instilled in you those concepts and values of what life is worth? This next quote sent me out laughing: It is actually a very short conversation and it is not a spoiler. How can a security officer loose you, Jimoh? So he thought you were still in the back seat? Jimoh nodded and laugh uproariously. Despite the fact that some parts of the story seem to be all forced that the novel ended with loose ends, on the whole it was a good read. I recommend it to very young adults and adolescents. On my blog it is categorised as a three star novel because I have to acknowledge that Buchi Emecheta has written better novels I have really enjoyed more than this one. Click here to read reviews of her other books I have read. Celestine, probably I was disappointed because I was expecting an Igbo female heroine and a story and writings similar to Joys of Motherhood. I am going to read your reviews right away. Can I we get the summary of the book. I am sorry, all I got is on the blog.